Whenver another season comes to an end, reflecting on what went right and what went wrong always comes in to play. For the 2017-18 version of the New York Islanders, there were much more negatives to outway the positives in what will be the second straight year without playoff hockey. 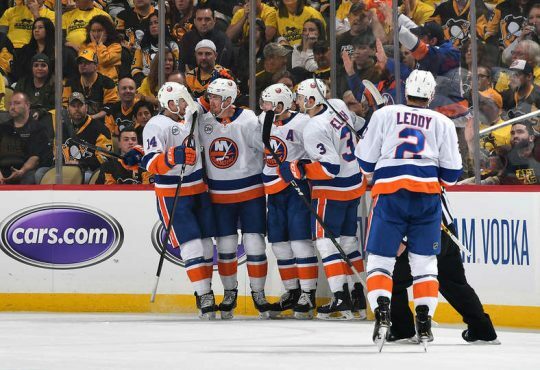 From the beginning to the end of the season, from individual players to team performance, the Isles season highs and lows all played a part in what became another lost season. 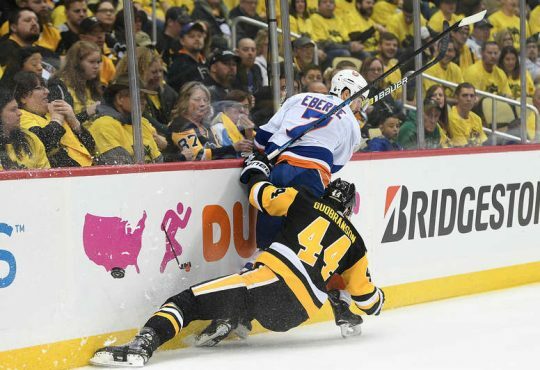 Our Rob Taub shares his five good and bad observations that defined the Islanders season. When training camp got underway last September, the expectations for prospect Mathew Barzal to make the Isles roster was more than less likely. Barzal, 21, showed flashes in the preseason that was going to make it extremely hard for the coaching staff to send him to the AHL or back to Seattle for another season in juniors. Once it was announced Barzal made the team, fans and critics voiced their predictions on just how good the Coquitlam, British Columbia native could be, especially that he won the second line center job slotting in right behind captain John Tavares. He didn’t record his first NHL point until the sixth game of the year in Los Angeles, but when the team came back from their West Coast swing, Barzal’s ascension to the top of the league began. In his first game and the Islanders first game against the Rangers back at Madison Square Garden, Barzal shined scoring his first NHL goal on Henrik Lundqvist and put on an offensive clinic helping the Isles win 4-3 in the shootout. After that night, Mathew Barzal became a household name. 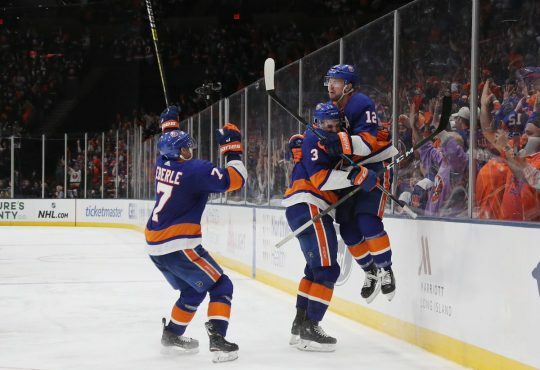 Over the next few months, Barzal would record three five-point games tying an NHL rookie record, plus show amazing chemistry with Josh Bailey, Jordan Eberle, and fellow youngster Anthony Beauvillier. Where Barzal was one of the best positives for the Islanders this season, was his ability to be a driving force on offense and show his phenomenal speed and skill. Barzal was a point-per-game player from the end of October till the end of the season. His impact on the second line gave the Islanders another deep threat in their top-six for the first time in almost 15-plus years. Watching Barzal go end to end with the puck, take the tour around the offensive zone, and create chances out of nothing mesmerized Isles fans, players and everyone around the league. Barzal will ultimately end up having the best season for an Isles rookie in almost 25 years ending with him without question being named the Calder Trophy winner as the NHL’s top rookie. The sky is the limit for Mathew Barzal. 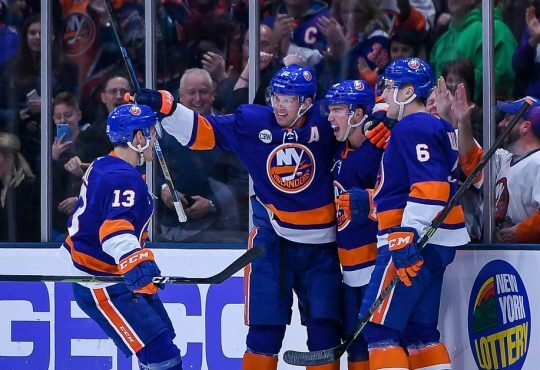 For the past few years, the Islanders firepower up front has continued to get better and better, making them one of the most feared throughout the league. This year though, the Isles offense was off the charts. The numbers speak for themselves. New York by season’s end will have finished in the top ten in goals scored and goals for per game and have finished with three players (John Tavares, Mat Barzal, and Josh Bailey) in the top 35 scorers in the league. But it wasn’t just the Tavares-Barzal-Bailey duo that made the offense so impressive. Anders Lee once again proved he’s one of the best scorers in the game. He notched his second consecutive season with 30-plus goals. Offseason addition, Jordan Eberle added another dynamic to the Isles sextet up front and produced a 25-goal campaign and was a solid contributor all season long. Sophmore Anthony Beauviller started slowly — and after a short stint back in Bridgeport — went to another level in the second half of the year leading to the first 20-goal season of his short career. The Isles top two lines (Lee-Tavares-Bailey and Beauviller-Barzal-Eberle) combined for one of most prolific top-six in the game right up there with the likes of the Winnipeg Jets, Boston Bruins, and Tampa Bay Lightning. The power play — which up until this year struggled to find consistency — was the best it has been in quite a long time. New York’s man advantage, after their horrendous start to the season, would go on to become one of the NHL’s best. Even with very little contribution from the bottom-six part of the forward group, the Islanders attack was the most fun and exciting in the last decade and a half. Two 80-plus point players, two 30-plus goals scorers, five 50-plus point players and five 20-goal scorers, there wasn’t much more you could have asked for. Isles fans clamored for the longest of days waiting for defensemen Ryan Pulock to finally get his shot with the team full time. Pulock, played in six of the Islanders playoff games in the spring of 2016, showing off his lethal shot and knack for offense. Coming into camp last summer, Pulock was one of three young blueliners (Scott Mayfield and Adam Pelech) that were going to battle it out for the open spot on defense, left behind after long-time d-man Travis Hamonic was dealt to Calgary at the draft. Pulock lost the spot to the duo of Mayfield and Pelech, but made the team and stayed on as an extra defenseman. The 23-year old would flip in and out of the lineup for over a month and a half because of defensive deficiencies. In late November, he finally got his chance to be a regular when fellow d-man Calvin de Haan became lost for the season with a shoulder injury. Pulock’s game little by little, piece by piece, began to improve. His play in his own zone was much crisper and he was showing more patience and poise with the puck on his stick. As the end of January rolled around, Pulock was playing top-four minutes and starting to pile up points. It can be said that after the All-Star Break, Pulock really kicked it into high gear and was the Islanders best defensemen the second half of the season at both ends of the rink. That included a 26-game stretch where he totaled 21 points. With his ELC expiring after this season, it’s hard to see the Islanders not rewarding Pulock with a nice, new contract. Eclipsing the 30-point plateau for the first time in his career, being the most improved on the blueline, and the team’s best d-man the second half of the year, all make Pulock a bright part of the club’s future. I wrote back in September that because of the depth, where Anthony Beauvillier was going to fit in the Isles lineup would be a question mark all season. Sad to say, I made the right call. Beauvillier came on strong in the second half of last season as the Islanders made their push to the playoffs — only missing out by one point. The Quebec native finished the season with 24 points, and it looked like Doug Weight and Co. had a player that could be really solid coming into this season. As this year got underway, Beauvillier couldn’t seem to find his niche in the Islanders forward corps. While the top-six excelled and fellow young gun Mathew Barzal on the cusp of lighting up the hockey world, the 20-year old Beauvillier struggled to produce in the bottom-six portion of the lineup. Only having seven points as the New Year rolled around prompted Weight and gm Garth Snow to send Beauvillier to Bridgeport so he could regain his confidence and find his game. In his first game back from his quick session in Bridgeport, Beauvillier would score the first of his many goals for the rest of year in a 5-4 shootout win against New Jersey. Six days later, he, along with Jordan Eberle and Mathew Barzal, combined for 11 points in a 7-2 rout of the Rangers at MSG, including a five-point night day for himself. Beauvillier quickly started to produce at a rapid rate playing on the second line with Eberle and Barzal, and his goal total begun to shoot up. Beauvillier’s play continued to get stronger as the season wound down. Before anybody could notice, he was pushing for the first 20-goal season of his career. Hitting the 20-goal mark after only having four goals on January 7th only shows the incredible turnaround of Anthony Beauvillier. He went through his sophomore slump before coming alive to be one of the best forwards on the team the last 40 or so games of the season. If Anthony Beauvillier can put on more muscle and continue his amazing chemistry with Mathew Barzal, the Islanders will have a steady 1-2 punch for years to come. Despite missing the postseason, Islanders fans can take solace in knowing that right now, their team owns their crosstown rivals, the New York Rangers. Posting a second season sweep in the last three years of the Blueshirts proves that the Isles have their number and winning those rivalry games never seem in doubt. But looking beyond the numbers, the supremacy that rookie Mathew Barzal showed in his first year of the rivalry establishes that he’s going to torture them for years, just as Islander legends Mike Bossy and Bryan Trottier did in the 70’s and 80’s. For years, the Isles were on the other side of this rivalry, being pummeled by their city neighbors for a solid five-year span. But a few years ago, the tide began to turn and the Islanders have ridden the wave. 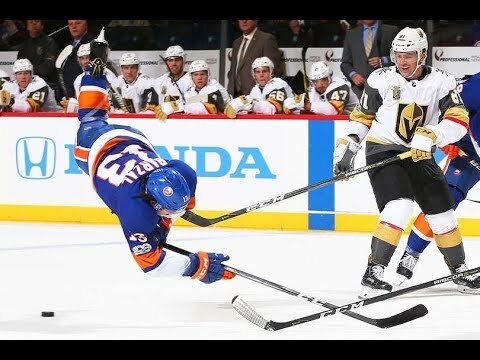 Going back to the 2014-15 season, the Islanders are an astounding 14-3-0 versus the Blueshirts and an impressive 12-1 in their last 13 games between the two rivals. They continue to own the Rangers at Barclays Center with a 6-0-0 record. Winning all four games this season, the Isles outscored the Rangers 16-6, including a memorable February afternoon 7-2 throttling at Madison Square Garden. Mathew Barzal recording ten points in the four contests tells you all you need to know about how one-sided this rivalry has become. We will kick things off with the biggest culprit for the downfall of the Isles in 2017-18, the defense. Going back now 13 years, no defense was worse in the National Hockey League than the New York Islanders. From the first game of the year till the last, keeping the puck out of the net became the team’s biggest crutch. Losing Calvin de Haan for nearly three-quarters of the entire season, Johnny Boychuk for a significant amount of time, and depending on veteran Dennis Seidenberg to repeat his performance from 2016-17 all play into the equation of why the Islanders defense was so pitiful. But it bears into comparison to just how awful the blue line was as a whole. The Islanders ranked dead last in goals against average, allowing an astonishing 3.58 goals per game all season. They allowed over 290-plus goals — over 50-plus more than the season prior — and had a team save percentage of .899, the worst in the entire NHL. Individually, there was a ton of regression on the backend. Nick Leddy went from possible Norris candidate early in the season to one of the worst defensemen on the team, including a horrific -42. Johnny Boychuk played through injury all season and broke down, Thomas Hickey struggled for long stretches, Adam Pelech (who was protected in the expansion draft) never got out of first gear, and Scott Mayfield, before getting hurt had his difficulties making rookie mistakes. There’s not much to say about Sebastian Aho and Brandon Davidson because of the small sample size, but they were thrown into a very rough situation. The Islanders defense was a gong show before they knew it was a gong show. The bleeding never stopped and it sent the Isles down a cliff that never had a stopping point. One of the many questions that plagued the Islanders as they headed into this year was could they lean Jaro Halak and Thomas Greiss to get the team back to the playoffs. Well, we know now, that answer was undoubtedly a NO. The problem was that how that NO came to be was just as disappointing as any aspect of the Islanders season. Some blame can go on the defense (above), but neither Jaro Halak or Thomas Greiss wasn’t good enough to get any benefit of the doubt. After last season’s three-goalie drama, it seemed that finally having two goalies would be the right formula. Halak did not have an overly terrible start to the season, but he was giving up one too many soft goals on a nightly basis. The same can be said about Greiss, who seemed to just have no confidence from the get-go. The offense was giving both goalies the support they needed, but allowing four or five goals a night was going to come back to haunt the team sooner rather than later. And when things got worse, Halak and Greiss did play a part. The duo combined for the worst save percentage in the league. Particularly Greiss, whose goals-against average was a gross 3.86 and save percentage was an unfathomable .890. The numbers are extremely ugly. Aeven when the team got a slither of hope from call-up Christopher Gibson, the goals and unlucky bounces thwarted any possible progress in the seasons final weeks. Just like the defense, the goaltending the Islanders received this season just leaves a bitter taste in one’s mouth. The future in between the pipes is unknown, but if it’s anything like the case it was this year, things will never improve. It’s almost been commonplace for Islanders fans to be accustomed to Garth Snow to lean heavily on his younger players to take steps forward in recent years. This year he asked his veteran players for the same feat and was badly rewarded with inconsistency and little production. Trusting his vets to lead the way also revolves around Doug Weight, who would allow some his veterans way too long a leash, even when the team was losing and never digging themselves out of a whole. I’m not going to bash Andrew Ladd — which has been done to him at length this season — because before he got hurt, he was putting up numbers and playing like the players the Isles $5.5 million a year to on the first day of free agency in 2016. But when he got hurt and when he returned, he was never the same. Not being able to score was a killer for Ladd, who produced most likely the worst season of his career. Jason Chimera (now with the Ducks) is another culprit that seemed to just show he didn’t have it anymore. He would show his flashes of speed, but his knack for scoring and physical presence evaporated leading him to be dealt. Brock Nelson, yes he’s a veteran, will probably get his 20-goals again. But once again, he continued his reputation of going invisible for long stretches of time and only putting a few solid games together. Nelson didn’t take that next step and proved once again, it’s time for him to find a new home. But beyond Nelson, players like Cal Clutterbuck, Casey Cizikas, Thomas Hickey, Dennis Seidenberg all underperformed, which played a key role in the team’s season going down the tubes. If there was anything to take from this year, it’s that the Isles need to get younger. The veterans didn’t provide the stability that’s needed in a year of this magnitude. Very little needs to be said about how fast the penalty kill went south. Greg Cronin’s crew were the worst penalty kill unit all season long. Weird to believe, the pk has been one of better strengths over the past couple years for the Islanders and they started the year quite strong. Seeing stalwart Nikolai Kulmein go down for the year in late October really was a crushing blow, but the team had the tools to keep the penalty kill afloat but instead folded. Much of the penalty kill struggles could come down to one major factor, not clearing the puck. This one aspect of the game can sum up a whole lot of the Isles year. Never in this decade — except for 2010-11 — was New York so bad at clearing the puck on the penalty kill or attempting to find ways to clear the puck from the zone. The whole “let the goalies see the puck” and not blocking shots also were detriments and made the penalty kill extremely vulnerable. And having John Tavares out there when they had a number of other defensively responsible options, made it harder for the team to use him sometimes late in games. To go from a top-ten penalty kill to the absolute worst in the league is a real shame. It’s an indictment on the team’s mentality and overall system. Now, it’s hard not to end what was crucial to the season going awry without talking about the coaching. Doug Weight chose his staff carefully throughout the summer and it looked as if he assembled a well-qualified group full of experience and decision making. Over the course of the season, both good and bad, it was clear that the coaching staff never made the adjustments that needed to be made to keep the train running on the tracks smoothly. Seeing how the team forgot that you have to play defense to win games and not tweaking the system until before it was too late is a black mark on Weight’s first full year behind the bench. Letting the veterans have the longest of leashes, even when they produced very little, also shows that the staff had too much faith instead of letting other players get a chance to play. I mentioned the penalty kill above, but Weight not changing any strategy and not infusing smarter plays in the defensive zone into the players’ heads, also showed his inexperience. Lest we not forget the “Dougie Blowouts”. The one problem that squared the organization dead in the face when Weight took over temporarily in 16-17 was there were a number of games the Isles didn’t even show up and were run out of the building. That trend continued this year and was even worse than last season. There’s much blame to go around for where the Islanders ended up. But coaching should definitely get some of the brunts of the fans frustratiom.